There is no doubt that Felix Tanner was a showman who enjoyed and used publicity to promote his own enterprises. He had already made a name for himself long before he came to live in Arrow Street, Wakefield, where he built his fourth and final Ark and, although he only lived for a short time here, his likeable, inventive and irrepressible nature deserves to be remembered as part of our local history. Born in 1863 in New South Wales, Felix was influenced at an early age by seeing the great tightrope walker, Charles Blondin. By 1875 he was a proficient tightrope artist himself and could jump from a balloon using a parachute. His first visit to New Zealand was in 1884. He called himself, "Mr Alexander, the Australian Blondin" and his repertoire included trapeze acts. Back in Melbourne in 1890 he began the second enterprise for which he is most remembered - fasting. His interest in this activity had been aroused by the story of Captain Dudley, who had been convicted of cannibalism in the 1880's. Felix wanted to show that one could survive for long periods of time on pure water supplemented with saltwater baths to keep the body hydrated. He also realised that money could be made from it and people were prepared to pay an entry fee to witness a man fasting. This fast was successfully undertaken for 40 days and he repeated the feat three times the following year and in many subsequent years after that. In 1896 he was married and working at Waihi. It was here that he invented a device for a mock hanging, to be used in full view of the audience, adding a realistic edge to the fate of the villain in the popular melodramas of the time. In October 1902 Felix was employed as a diver with the New Plymouth Harbour Board. When the Tilikum arrived in port in June 1903, it was for him a life-changing event. This was a modified cedar dugout canoe with three small masts, a decked over hull, cabin and open cockpit. Its prow was a snout-like tip reminiscent of a deer or dog's head. It was on a world tour. Felix took a great interest in this boat. An idea formed in his mind. He could build something similar and tour the world - a barrel boat! Seized with enthusiasm, Felix completed his plans in a month and began to build in his backyard. When finished it went on display (with the request for an admission fee) as the "only barrel sailing craft ever built." All was not plain sailing, however. Vandals bored holes in the hull and it sank at its moorings. Eventually it was repaired and refloated, but Felix saw the need for a new shape - more like a brandy bottle - so off Oakura it was run ashore and abandoned. Felix moved on to Wanganui. Soon he released plans for Ark No. 2. Eventually the boat was launched on 5th April 1904, but it got no further than six miles off the entrance to Wellington harbour and was eventually beached in Ohau Bay (near Cape Terawhiti). It was never successfully refloated. Felix thrived on publicity and his fame had now spread far and wide. A snippet from a newspaper of the time illustrates this: "Teacher addressing a class of infants in a Fielding Sunday school: 'Who can tell me who built the Ark?' A long pause, after which a small boy excitedly replied, 'Please, Sir, I know. It was Tanner.'" By September 1904 the Tanners were in Wellington and Ark No. 3 was ready for launching. This was his largest boat so far - 25 feet in length but its end was no more successful than the first. A crossing of the strait was achieved, but a westerly gale off Kaikoura proved its undoing and Felix and his crew were rescued by the steamer Mokoia. Ark No. 3 was abandoned. The New Zealand International Exhibition in 1906-07 prompted him to build Ark No. 4. It would be a new type of lifeboat, strong as a barrel and unsinkable. This final ark was built at Felix's home in Arrow Street, Wakefield, 18 miles from Nelson. It was hauled to the port by lorry and traction engine. Thirty feet long with a beam of 9 foot 6 inches , oval shaped and made of white pine supported by hoops of galvanised steel, it weighed two and a half ton s.
This time it was smoother sailing. It reached Lyttleton after a voyage of ten and a half days. The change of shape had worked well. Felix believed that in future his design would be the preferred shape for lifeboats on ocean liners. 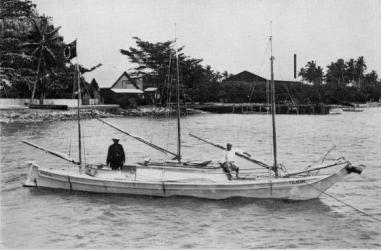 In June, Felix left Sumner, where the boat had been on display, for Timaru. He beached the Ark and returned to Wellington. He said he would return at the beginning of summer and sail the Ark to Sydney - but he never did. In the spring he sold Ark No. 4 and she was used as a coastal fishing boat. His inventiveness, however, was undiminished. In 1910 Felix made some serious money when he sold his rights to the "Wakefield Electric Propeller Governor", an apparatus for preventing the racing of marine engines, to an Australian syndicate for NZ £25,000 . In 1913 he invented a new type of davit in partnership with A.W. Robertson, an engineer and shipbuilder. On 2nd October 1915 the Colonist reported him as "the well-known inventor" who had designed a shell specifically for destroying barbed wire entanglements in World War I. We do not know how Felix spent the last few years of his life, which is unusual for a man whose exploits were so frequently publicised, but on Thursday January 2nd 1919, the Melbourne "Argus" reported that the "well known fasting man" had died in San Diego, California. Perhaps someone reading this article can fill in the gaps and will tell us. Was he an eccentric crackpot with "a diseased craving for notoriety" or a visionary inventor who followed his dreams? Whatever your final judgment, one cannot deny that he was a colourful, energetic, persuasive character who brightened the lives of those who knew him. In writing this article for The Prow I have drawn extensively on Felix Tanner Man of Arks and other things in New Zealand by Margaret de Jardine (ISBN 0-476-01440-9) who kindly agreed to let me use her material. I have also found Papers Past to be a valuable source of detailed information. Credit must also be given to the Waimea South Historical Society for their 1991 publication From River to Range (ISBN 0-473-01466-1) whose article and photograph of Ark No. 4 in Arrow Street in 1906 sparked my interest in this fascinating character. Note - there is some uncertainty surrounding certain details of Felix's life. He may have been born as Charles Jackson, 1863, in New South Wales and, rather than dying in 1919, he returned to Australia to father many children until his death in Merrylands NSW in 1943. De Jardine, Margaret (2005). 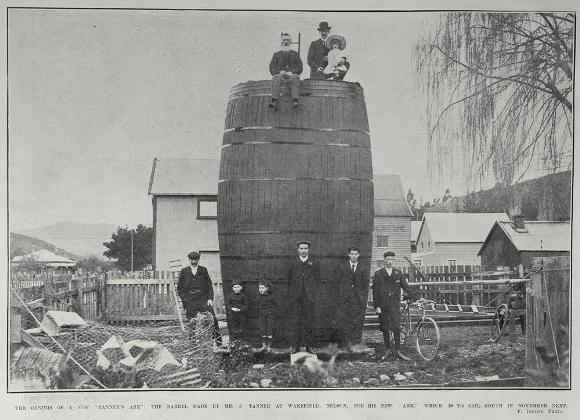 Felix Tanner: man of arks and other things in New Zealand. New Plymouth: Margaret de Jardine. Waimea South Historical Society. (1991) From river to range. Nelson: WSHS. Want to find out more about the Felix Tanner ? View Further Sources here. Hi there...sorry but you info on this gent is incorrect, he was Australian and did not die in 1919 as his last marriage was in 1911 --I'm a great grand daughter -- he still has living children from his final marriage his you gets was born in 1924 and he passed in the 1940's I'm happy to share our family history if you would like the correct information. Ed. We have made contact! Tanner, Felix (c.a.1913). Fasting as a cure for bodily ailments and disease: 23 years experience. Leicester: Wilson's Printers. Advertisement. (1914, 13 March) Thames Star, p. 6. Felix Tanner: the man who starves to live, story of his life. (1911, 15 April,) Northern Star (NSW), p. 2. A new marine Governor (1910, 8 December). Clarence and Richmond Examiner (NSW), p. 4. Local and general. (1910, 25 November) Wairarapa Daily Times, p.4. Well known fasting man dead. (1919, 2 January,) Melbourne Argus. p.7.